You should have cleaned your entire motor vehicle before dismantling the engine to prevent dirt and debris from entering the engine case. Wash the cylinder with detergent and hot water (not solvent), ensuring that all surfaces are clean and free of any loose material. Wipe the cylinder wall with your usual engine oil. Power valve parts must be free from dirt, dust and carbon. When fitted into the cylinder they must operate freely. If they do not, remove the power valve part and identify and if necessary relieve the obstruction with fine silicon carbide waterproof abrasive paper. NEVER FORCE ANY PART TO MAKE IT FIT. DOING SO WILL VOID YOUR WARRANTY!!!!! Ensure that the crankcase internal parts are clean as any debris which has entered on disassembly will undoubtedly be sucked straight into the combustion chamber and cause rapid wear to your new coating and piston. Ensure the piston to bore clearance and piston ring end gap is in accordance with manufacturer's specifications. Allow ample ring end gap. Use the manufacturers specification if possible, if this can not be found use 0.50mm as a minimum.There is far more danger of ring butting than an appreciable compression loss. 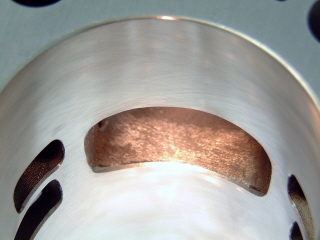 Care should also be taken to ensure the the end gap can be closed around the the locating pin. It should be noted that many manufacturers now offer pistons of varying sizes often graded A,B and C etc. Please call us before assembly if in doubt. Follow the manufacturer's instructions. If these are not available the following procedure should be used. Use the same oil mix as you normally use. Do not use an extra rich oil mixture during break-in. Allow 30 to 40 minutes running at light throttle to break-in the new piston, rings, and plated bore. Allow the engine to cool down re-torque the cylinder and cylinder head to factory specifications. Re-start the engine and continue to use light throttle for a further 30 minutes minimum. All engines must be brought to normal operating temperature before recing to avoid seizures and to ensure thorough lubrication. Liquid cooled engines generally take much longer to reach their normal operating temperature than air cooled ones. This can be caused by "I've just had my bike fixed" syndrome. We have seen examples where bike shops have replaced a piston and although they have checked the clearance, which is more than the minimum because the cylinder has done a few hours from new, it has siezed within a few minutes running. This happens because the owner gets his bike back from the shop, it starts much better and sounds real crisp. so he gets on and gives it WOT straight up to see how well it perfoms, after all it has just been to the shop so if anything goes wrong it will be covered by warranty! Sorry, see race warm up above. The worst part is the bike shop are often asked to pay for a mistake which is not theirs, the cost may now include a cylinder replate.